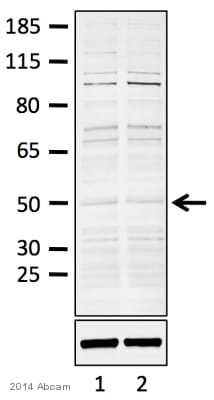 ab12875 detects a single clean band of just below 50kD in Jurkat and Hela cell lysates. This band corresponds to the size of Aurora A seen using other antibodies. Synthetic peptide conjugated to KLH derived from within residues 50 - 150 of Human Aurora A.
Recombinant Human Aurora A protein (ab86846) can be used as a positive control in WB. Jurkat cell lysate. Our Abpromise guarantee covers the use of ab12875 in the following tested applications. IHC-P: 1/15 - 1/20. Antigen retrieval was performed using either Sodium Citrate or Tris/EDTA before commencing with the IHC staining protocol. Customer feedback suggests that a 1/15 dilution of ab12875 is recommended when using the sodium citrate antigen retreival method and a 1/20 dilution is recommended when using the Tris/EDTA antigen retrieval method. WB: 1/500. Detects a band of approximately 46 kDa (predicted molecular weight: 46 kDa). Contributes to the regulation of cell cycle progression. Required for normal mitosis. Associates with the centrosome and the spindle microtubules during mitosis and functions in centrosome maturation, spindle assembly, maintenance of spindle bipolarity, centrosome separation and mitotic checkpoint control. 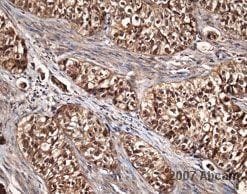 Phosphorylates numerous target proteins, including ARHGEF2, BRCA1, KIF2A, NDEL1, PARD3, PLK1 and BORA. Regulates KIF2A tubulin depolymerase activity (By similarity). Required for normal axon formation. Plays a role in microtubule remodeling during neurite extension. Important for microtubule formation and/or stabilization. Highly expressed in testis and weakly in skeletal muscle, thymus and spleen. Also highly expressed in colon, ovarian, prostate, neuroblastoma, breast and cervical cancer cell lines. Belongs to the protein kinase superfamily. Ser/Thr protein kinase family. Aurora subfamily. Activated by phosphorylation at Thr-288; this brings about a change in the conformation of the activation segment. Phosphorylation at Thr-288 varies during the cell cycle and is highest during M phase. Autophosphorylated at Thr-288 upon TPX2 binding. Phosphorylated upon DNA damage, probably by ATM or ATR. Ubiquitinated by CHFR, leading to its degradation by the proteasome (By similarity). Ubiquitinated by the anaphase-promoting complex (APC), leading to its degradation by the proteasome. Cytoplasm > cytoskeleton > centrosome. Cytoplasm > cytoskeleton > spindle pole. Detected at the neurite hillock in developing neurons (By similarity). Localizes on centrosomes in interphase cells and at each spindle pole in mitosis. Metaphase HeLa cells stained with ab12875 and counterstained with DAPI. The antibody shows the localisation of Aurora A to the centrosome during metaphase. 100x magnification. Panel 1: DNA stained with DAPI. Panel 2: Cells stained with ab12875 (1/500 dilution). Panel 3: DAPI staining is shown in red and ab12875 in green. The image shows staining of formalin fixed paraffin embedded human tonsil sections with ab12875 (1/20 working dilution). Clear nuclear staining can be seen. Publishing research using ab12875? Please let us know so that we can cite the reference in this datasheet.